Tantric Journey is a holistic treatment program that incorporates Tantric and Tao bodywork techniques alongside other recognised holistic modalities. The aim of the treatment is aiding people to gain release from negative trauma in order to overcome a range of physical, sexual and emotional difficulties including depression, sexual dysfunction, past trauma, low self-esteem, overcoming past abuse and increasing well-being. Tantric Journey also provides training and education in the field of emotional release through bodywork and is committed to increasing awareness of work and techniques in this field. 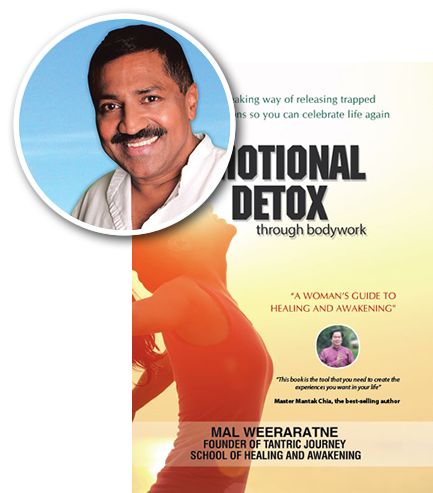 Mal Weeraratne is the founder of Tantric Journey – School of Healing and Awakening and author of Emotional Detox through bodywork. Mal is a British pioneer of emotional release through bodywork, with over 20 years’ experience, treating over 3500 clients from all walks of life from the UK, USA, Europe and Asia. Mal has developed Tantric Journey a healing and awakening technique based upon the ancient principles of Tantra and Tao in conjunction with ground breaking Western knowledge; to create a powerful and transformative form of therapy that is capable of releasing trauma at a cellular level within the body. Tantric Journey is a spiritual treatment for awakening, sexual healing and relationship therapy. We do not regard it as a sexual service nor is it focused upon exclusively treating one’s sexual organs; instead, it is a healing therapy that treats the whole of your being.